What do you pay attention to when you design book covers? During my presentation today at the Self-Publishers Online Conference I got into a discussion with Susan Daffron about this point. 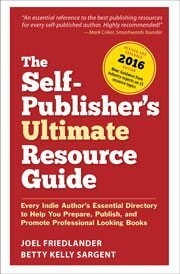 We were going over the ways that self-publishers can miss the mark with their book covers and how to recognize that. I’ve often wondered why it is that, when I’m asked to design the cover for a novel, I have to read quite a bit of it before I feel ready to take on the task. But with nonfiction, skimming the book is usually enough to get me ready. I’ll dip in here or there, but it’s strictly an information-gathering trip. When designing nonfiction covers, we want to communicate to the reader the benefit of buying and reading the book. Most nonfiction of this type depends on conveying useful information or actionable opinions. (I don’t include literary nonfiction in this category. Biographies, autobiographies, memoirs, criticism and essays use different design criteria). The book might rely on the author’s expertise, notoriety, or popularity. But usually it’s offering to teach you something, or tell you stories. It has a clear reason for being, and that’s what should be the most obvious the moment you look at it. Text, and sometimes lots of it. Nonfiction books can have long subtitles, author’s qualifications, blurbs from other experts, awards, even bullet lists on the cover, all in the effort to tell you how much information is inside, and what it will do for you. Legibility, since the clear communication of the message is all-important. Rational, linear organization. The hierarchy of information should be clear, with graphic elements kept to a minimum. Fiction is an entirely different matter. Here the communication can be allusive instead of literal. For some novels, logic and linear organization wouldn’t fit. With the introduction of more evocative imagery the designer’s palette and possibilites expand. On these book covers I’m trying to communicate the author’s tone more than anything else. It’s the voice of the book that needs to be expressed through the cover design, and that’s why I have to read a lot more before I get started. What Does This Book Promise? What’s the Offer? Whether fiction or nonfiction, each book makes an offer to prospective readers. In a book on how to build brick pizza ovens, the offer ought to be crystal clear—the information on how and why to build one yourself. But part of the offer is also the satisfaction you get, or that you imagine you’ll get, when you build that oven and pull a gorgeous pizza out of it. In a book on leadership, the offer might be harder to discern, but it’s there. Ideas and inspiration to help the reader do her job better. And beyond that, the feeling of improving oneself, gaining insight. And in fiction, the offer is the most mysterious of all. It could be for a couple of hours of entertainment, something to keep you occupied on a cross-country trip, perhaps. Or insight into what it’s like to be human. It could be a dramatic or cathartic experience. Novels cover a lot of territory, but part of their offer is enabling you to lose yourself in another world, transported beyond your ordinary life. That’s a powerful offer. In every case there’s an offer, something promised, something the book has to deliver on to be a success. It’s what’s behind that offer we want to capture on our book covers. If we can, the cover will really be doing its job. How can you get at it? This may be difficult if you are also the author, but try this: Imagine the ideal reader of your book. Imagine they have just finished it and put it down, deeply satisfied at the experience. Where did that satisfaction come from? Answer that question and you’ll be on your way. I’m using an image-wrap, which is perfect for my Memoir. Not for everyone, though. I actually find that graphically stunning covers for non-fiction work very well when tailored to the audience. Examples might be design-related topics, art topics, or anything geared towards the creative industry. If I am faced with 10 informational books on gardening and they are all mostly text based, none of them are selling to me or appealing to me specifically. If one uses a vintage design style with images of lush medieval Italian gardens, I will actually grab that over the other 9. I am displeased with ambiguous comments such as “she isn’t charging a lot for her services…” . She could charge $50,000 and the cover could sell a million copies. Is $50,000 a lot? Julie, that’s very interesting. I think the great cover image you found is perfect for your book, nice job! I just want to put in a plug for my editor (freelance), Cassandra Marshall. She edited my novel, A Silver Ring, and then “just for fun” took “a stab” at a cover for it, and it absolutely blew me away. You can see it at the top right corner of my blog’s body section at http://www.writingtakesflight.com and more info on the book’s at http://www.asilverring.com, if you’re curious. When we hire a designer, he or she will often ask for a detailed synopsis of the book, descriptions of the main character(s) and the message the author is trying to impart (in one or two sentences). When we do covers in-house, we have of course read the book through many times and have a clear understanding of what needs to be conveyed. Still, some covers are great, others don’t grab the attention we hope for. Thanks for the post. I will try and keep that one idea in my head when I begin to design for my book cover, “tone”. Never associated that with book cover design. I guess I had the word “theme” in mind. But tone is better. Thanks. I find it rare that the author does not know what the appeal of their book is… Or with some simple questions can be lead to naturally express that hook. So after having a chat with the author we are well on our way to a successful book cover design. For me personally, I sketch covers as I am talking to the client. Most of the time one of those sketches ends up being the spark for the final cover. All without reading the actual book. We do read, don’t get me wrong, it’s just that we so often know the end product after our author interview. Jerry, that’s very interesting. I’ve had the opposite experience. I find authors, although they have critical information I need as a designer, to be a weak source of design concepts. Of course, if an author mentions an idea they have for the cover, I will always include that in my presentation to them. Unfortunately, I find most authors suffer from an excess of literalism. But I also rely heavily on the interview with the author to set the overall tone for the cover design. Your method must work pretty well because your book covers are gorgeous. Thanks for giving us some insight into your method. Joel, where do you stand on printing “a novel” on the cover of a novel? Well, you have a point, Michael, but on the other hand this practice is so widespread you may be tilting at windmills. In some cases it seems to be useful to readers who might not otherwise know the book is fiction. On the other hand, as I point out in the article, designs for fiction usually have very little text on them beside the title and author’s name, so the “A Novel” tag both identifies the book and gives the designer another element to work with. So my conclusion is: whatever suits you.